Protect Local Peterborough (PRP) is a campaign to oppose proposals for a Township in the middle of open countryside. PRP has been set up by residents of nearby villages because we believe that the draft proposals will change the the local countryside forever and is the first step in the urbanisation of this beautiful rural area (Click to see film). It will house 6,250 people, including 1,000 school age children and 4,000 cars – which means 1,250 car movements at peak drive times. The infrastructure needed to support this will be huge. Threat to wildlife. The site is very close to Castor Hanglands – a unique wildlife reserve and Site of Special Scientific Interest. 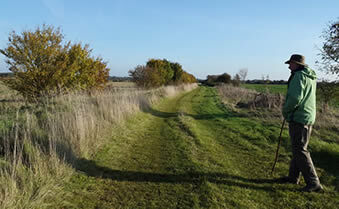 There are many other smaller wildlife habitats throughout the Parish, and the site will cut off wildlife corridors from Helpston to the River Nene. Creating a Township. The initial HCA proposal was for 5,000 homes. While the current plan is for 2,500 houses, the Country Park’s green space could potentially mean room for more housing – perhaps up to the 5,000 total. A decade of impact on the countryside. In Hampton, homes were built at a pace of 400 homes per year. It will take around two years to put in infrastructure (electricity supply, roads, water, sewerage) followed by potentially six more years to build housing.